Raw Ultra is proud to present Dublin’s first Mountain Marathon. ​You will be tested with this fantastic route overlooking Dublin City from the best viewpoints and it’s many climbs. The Dublin Mountains Way was officially opened from Shankill to Tallaght on 31st October 2010. The entire route from Tallaght to Shankill is now fully waymarked. This route is waymarked with the standard yellow walking man symbol. 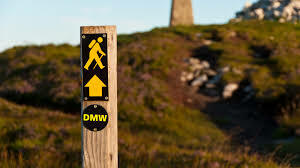 The sections where the Wicklow Way and Dublin Mountains Way run alongside is signed with DMW and WW to avoid confusion. One of the flagship projects of the Dublin Mountains Partnership is the establishment of a long distance trail, the Dublin Mountains Way (DMW), across the mountains from Tallaght to Shankill, in all approximately 42 kilometres of trail. Half Marathon & Full Marathon Options available. More information & full routes available on Raw Ultra’s website. Start Times and Exact Starting Points to be confirmed. Bring a finish bag to the start and we will have it waiting for you at the finish. There will be no parking at the start of either races. Use public transport or another alternative. Numbers will be posted out pre- race. Water and other goodies on the route.